A molecule containing nitrogen with the chemical properties of a base. 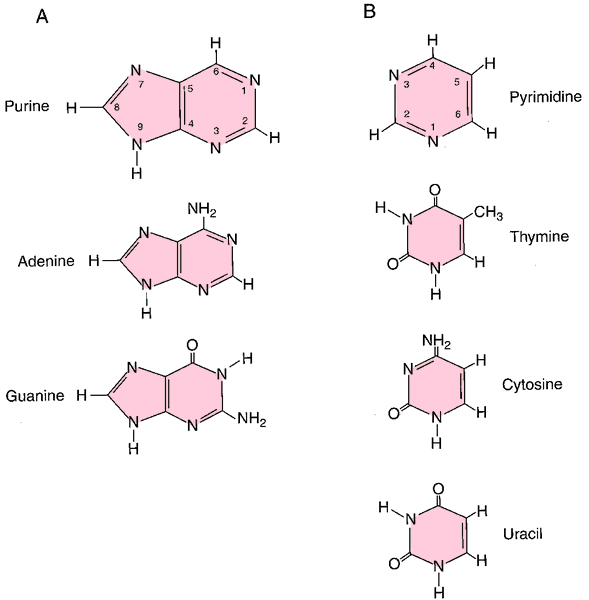 • Purine bases—Adenine (A), guanine (G). • Pyrimidine bases—Cytosine (C), thymine (T). • Pyrimidine bases—Cytosine (C), uracil (U). Each triplet of nitrogenous bases, known as a codon, on the messenger RNA represents a code for an amino acid. From the results reported here, the accelerating effect of 2HT and IMZ salts can be justified, taking into consideration: (1) the presence of nitrogenous bases in both types of salts, in the imidazolinium ring and after thermal degradation occurring in vulcanization in 2HT, and (2) the increased mobility of sulfur anionic species. Also, given the fact that oxidative stress is associated with damages at the DNA level, we can mention an enzymatic DNA repairing system, that identifies the oxidized nitrogenous bases in the DNA structure, removes them and replaces them with unaltered nitrogenous bases (10).